Mobile devices are no longer simple voice communication devices. They have become a medium to create voice, music, text, video, and image communications. Importantly, these various interactions can be created and shared on demand by the mobile user. In addition to communication methods, mobile devices are also a tool used to access the Internet, view television and movies, interact with GPS (Global Positioning System), play games, and read and respond to barcode and augmented reality messages. The reach and functionality of mobile devices depends on their underlying network infrastructure and the capabilities of the mobile device or handset. Mobile communications also rely on specific access methods which operate on top of the physical wireless architecture. There are generally three types of access methods in use: FDMA, TDMA and GSM, and CDMA. Although mobile devices are most commonly associated with mobile phones, there are many types of mobile devices. Some have broad usage such as smart phones and mobile tablet devices, and some are very specific such as telematic devices in vehicles and devices that monitor vital signs in healthcare. “It’s all about the apps” is a common refrain we hear in the world of mobile technology. Not only are mobile applications the key to innovation and customer expansion, it is also a high revenue business. There have been over 300,000 mobile applications developed over the last 3 years, and these applications have been downloaded 10.9 billion times. Whether the applications are used for communication, entertainment, socio-economic growth, crowd-sourcing social and political events, monitoring vital signs in patients, helping to drive vehicles, or delivering education, this is where the mobile technology has been transformed from a mode to a medium. The profound changes that mobile technologies have introduced into our world had quite humble beginnings. It began as a simple two-way communication device and has become a powerful social tool. To gain a full understanding of the impact of mobile technologies, it is worthwhile to examine its history from several different perspectives. From the user perspective, the history of mobile technologies began with the use of two way radios and evolved to the current state of prolific smartphones, tablets, and other mobile devices. From the technical perspective, the history of mobile technologies originated with the limited use of radio frequencies; where the ability to establish simultaneous two-way communication (full duplex) was considered a technological feat. In the present day, mobile devices are quickly becoming IP devices which use the TCP/IP protocols to access, receive and transmit data. Historically, TCP/IP is viewed as a networking protocol most commonly associated with communications through the Internet. This change has required significant transformations in the underlying mobile infrastructure that is still occurring. From the social perspective, mobile technologies began as a rare device used by limited personnel who needed to communicate to others in real time emergencies such as police and the military. Mobile technologies are used today to provide health care services, deliver education, organize political events, market new products, provide location services, and deliver games, music and video. Mobile devices are considered to be “the most personal piece of technology that most of us will ever own” (Krum, 2010, p. 7). We usually take them with us wherever we go and are usually reachable through them. They store and record some of the most personal information about us: who we talk with; where we go; what we buy; where we bank; our family, friends and business contacts; and often employer information. Mobile devices are no longer simple voice communication devices. They have become a medium to create voice, music, text, video, and image communications. Importantly, these various communications can be created and shared on demand by the mobile user. In addition to communication methods, mobile devices are also a tool used to access the Internet, view television and movies, interact with GPS (Global Positioning System), play games, and read and respond to barcode and augmented reality messages. The reach and functionality of mobile devices depends on their underlying network infrastructure and the capabilities of the mobile device or handset. At its most fundamental level, wireless networks are based on the use of electromagnetic frequencies or spectrums. 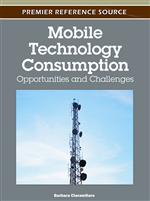 Mobile networks operate in a very small slice of available frequencies from 700MHz to 3,000MHz and are viewed as a rather scarce resource (Synder, 2009). This is the reason for the highly competitive bidding by wireless vendors when the government auctions off frequencies. Wireless communications has some unique characteristics such as frequency reuse, handoffs, and cells. Frequency reuse allows wireless vendors to maximize the number of users they can support within a set of frequencies they have licensed. Handoffs are the reason that wireless communication can traverse distances. As mobile users travel from one location to another, their call is handed off from one cell to another. If wireless users increase beyond the capacity of a given cell, a wireless vendor can divide the existing cells into smaller units to support the additional load.